This Stressless Imagine Comfort Lifestyle Sell illustrates the look of Danish Modern in your home and true lounging comfort in your life. Both “sells” seem to naturally go together in this in-store advertising complete with built-in Literature Holder offering The Stressless Book of Comfort. 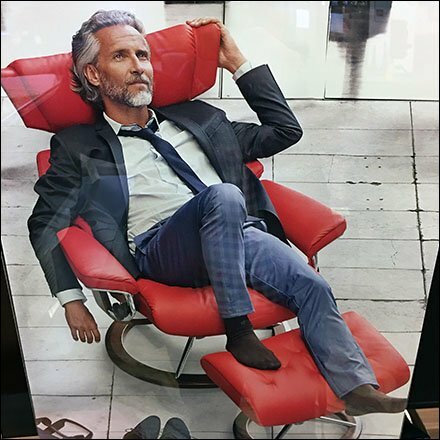 Look close to see Stressless branding a the “Made in Norway since 1934” tag line. This Stressless Imagine Comfort Lifestyle Sell, as well as their recliners and chairs, seen at Dane Decor, Downingtown, Pennsylvania.